Yes, there is a way of living and being in the Universe that is divinely inspired, that flows through you with a sense of rightness, that creates synchronisitic miracles and magic all around you; that is infinitely benevolent and working tirelessly just to reveal the majesty of You. What's more, we can live that way and thrive in it, right now. I'm blessed to witness it all the time: when we come togther at these Openhand gatherings, people come into themselves, and the divine being in them emerges. There's an empowerment and a confidence that they can step forwards into the world and just be them - that somehow it will succeed. It's an exciting time to be on this journey for sure. Previously, there was always the soft shoulder of the matrix to lull people back into the confinement and limitation of the Old Paradigm - the old way of being. But now, it's becoming increasingly clear that the old ways don't work for us anymore - not only do they limit authentic beingness, but they're destroying the environment in the process. There's way to much searching 'out there', for what's really 'in here'. The beauty is, that you can choose, right now, just to be you, and connect the dots of the Universal flow. That's what we're reflecting to each other at the gatherings. You get that tremendous resonance that says, it's right, entirely perfect to let the True Self in you emerge and step forwards. 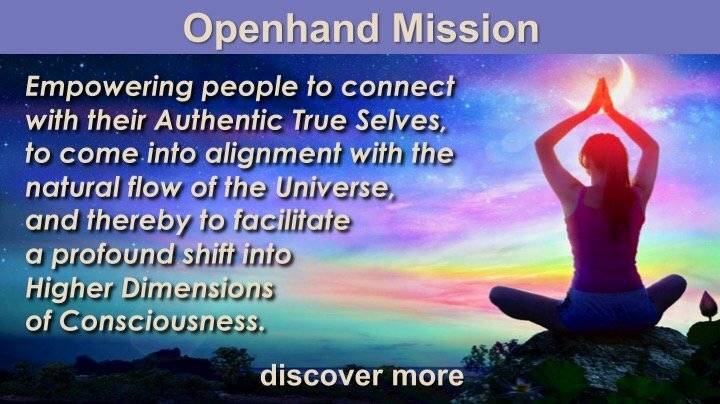 I think what makes the Openhand work so rewarding, is not that it just connects you to the peace of your True Self for a while, but demonstrates how to live the flow of higher consciousness in your daily life, in a way that is aligned with the Shift itself. We're well into the current tour right now, but there's so much more yet to come. 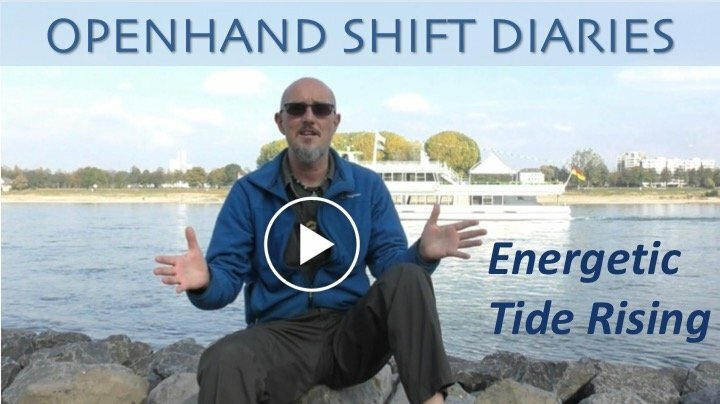 Various gatherings around the world to look forwards to, plus new ones we're about to add to the calendar: a new webinar will happen early in January, plus new Paradigm Shift events in the UK, and the USA in March. Plus we'll soon be announcing the stage 2 and 3 elements of the work, the 5GATEWAYS retreats and the annual DIVINICUS gathering. Plus of course we'll be involving everyone through this web community, through new videos, guided meditations and regular articles. So do stay tuned. Know that you're a part of a worldwide family in the Shift, and that the pace is gathering around us. Let's connect up to the flow, work through the obstacles and let it unfold us. Let's catch the waves of The Ascent! You nailed it when you said "You get that tremendous resonance that says, it's right, entirely perfect to let the True Self in you emerge and step forwards." The NY retreat truly empowered me to let my True Self emerge. It was an incredible experience to meet you and so many like minded souls. I no longer feel alone in the Universe! I'm looking forward to the announcements for next years events, I can't wait to spend time with you again and reconnect with the wonderful souls I met in NY. Scott, it was such a pleasure hosting you and connecting with you. A real privilege. The new dates for 2019 will be out before Christmas - we've got a tremendous venue in Seattle lined up for 5GATEWAYS in April (5th-10th). It promises to be a great one already! Love the new video!! What really resonates for me in this sharing is the emphasis on connection amongst like-minded souls...seeking the inner truth and expressing fully one's Self. With you through the ether. Love, Joanne. Nice to have you tune in Joanne. Greetings to you and the crew up in Nova Scotia! Living life "in the flow"
I thought I would share my experience from last night of "living in the flow". Last night my sister and I were on our way to the Clearwater jazz Holiday to see Mindy Abair and George Thorogood. Cheryl had asked a few days earlier if we should buy tickets and the pull was to answer "lets get them the day of". On our way from the car to the venue, I realized I was still wearing my sunglasses and had left my glasses in the car. My forgetfulness was the reason we stopped walking and paused at the corner, no big deal, I decided to go back to the car and Cheryl would wait for me with our chairs as we were planning on sitting in the GA section. Out of nowhere this couple appears and asks us if we are George Thorogood fans, I'm not a huge fan, so being my authentic self I point to Cheryl with a smile and say "she is!". The couple proceeds to offer us complimentary Hospitality tickets, taking the time to make sure we knew where to get the wrist bands, where we should sit up close and that it included free food & drinks! They told us they like to do nice things for happy people and that we looked like a good couple (We omitted the fact we were brother/sister!). They were the nicest people and it was just the most wonderful experience. I couldn't stop thanking them and telling them how appreciative I was. As we were talking they asked if we would like a parking pass which allowed us to park right next to the back stage area! I was so thankful for their generosity and kindness. Instead of sitting a mile from the stage, we ended up 10th row dead center! What an amazing experience in the flow! I love your sharing Scott - nothing like being in the flow! Here's a song that I often play at the beginning of an Openhand workshop, just to get people in the zone. Looks to me, that this was another amazing journey on the way to the source. It also looks like you had a visit from the black snake. The Mother Mary made her presence knoen in the shadow image in the photo with Heike, Max and Sascha. Thanks for all the sharing and being you. What a weekend of emotions, energy work and last but ot least - humour! Thank you all wonderful people for the sharings and conversations we had. After ceveral courses over the last one and a half year this one also had his special main focus for me - less trauma work but Contemplaiting ever deeply about my truth while feeling for reflections in the Openhand philosophy. The harmonious group energy very helped me doing this. More things became clearer now. I feel more grounded and secure in my own being. Feeling and looking for the next step to appear. 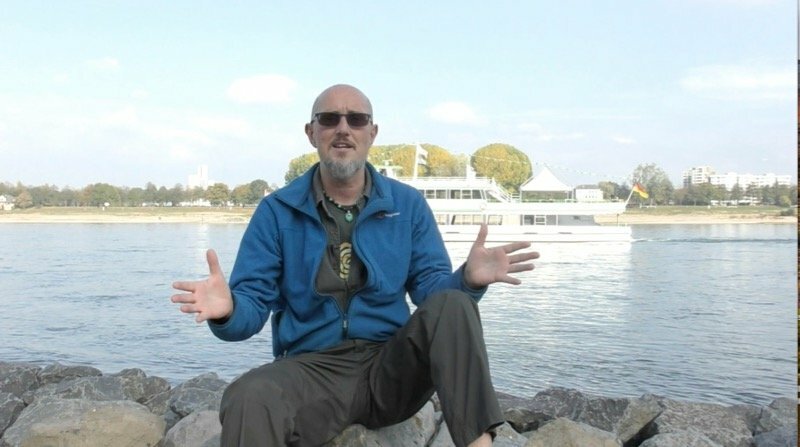 At first everything failed and it seemed like it wasn't wanted for me to join the workshop in cologne. But I thought: If it shell be, it will be! I nearly had given up when suddenly - just in time - the puzzle completed by itself. And click! All flew in a perfect way with the help of Florian, Ludwig, Aspasia, all of you and of course Open. I'm very happy and thankful having been allowed to join the workshop in cologne with all of you. It was a huge present to me, which remembers me to all the things that i know but don't really belive in. Those things, which get lost in everyday life and are really difficult to integrate. You can only help them to stay alive through rituals, meditation and prayers. Always repeat the memory on what is essential. Thanks for the very good and really spontanious help that gave me the chance to be a part of this deeply touching event! I just want to thank everyone who guided, assisted, participated and gave of yourselves in this profound and magical event. I was deeply touched by all of your voices. The choral symphony of sounds we created on our first day together will echo and reverberate in my soul for a long time to come. In the morning of our second day, the sun shone in so beautifully through one of the windows. As we, in meditation, received the energy of the day to follow, my body was touched by the warm rays and I found myself turning my face up towards the light, like a flower opening up in springtime. As my soul was basking in this moment of awakening to the connection with Mother Nature, a musical memory of “The Rose” came to me. I now want to share this experience with all of you by dedicating this old classic to this moment in time that we shared together. What a wonderful weekend in Cologne with lots of interesting energies keeping us on our toes! Thank you all for being there! After we finished on Sunday, my journey back to the Netherlands that evening was quite an interesting unraveling, reminding me to not necessarily take things at face value, but rather trust that the universe has a bigger plan, possibly through a cosmic joke.... As our train got stranded for one hour in Dusseldorf, because there were people on the train tracks ahead of us, I saw my window of still making it home that night slowly closing down. However, the universe eventually miraculously organised a taxi paid by the railway company for the last 60km of my journey (which I wasn't necessarily 'entitled' too, because there were still hourly night trains that could have gotten me home very late) that was to drop me off at 'Monkeys Dance 11' (no joke, there is actually a small street in my postal code area with the street name Monkeys Dance! ), and I got home only 10 minutes later than originally scheduled with a big smile on my face about this cosmic joke. However, during the one hour in Dusseldorf without clarity about how long the interruption would take ('it could be anywhere between 5 minutes and 4 hours') my 'monkey mind' definitely performed a big dance around all the possible scenarios that could unfold, but the scenario that eventually unfolded was beyond my wildest dreams and somehow felt like a wink from the universe. Here I share with you a wonderful poem by Erich Fried. During the workshop I was several times reminded of it. This poem is in my heart since 1979 and it has always been a good advisor on my way. 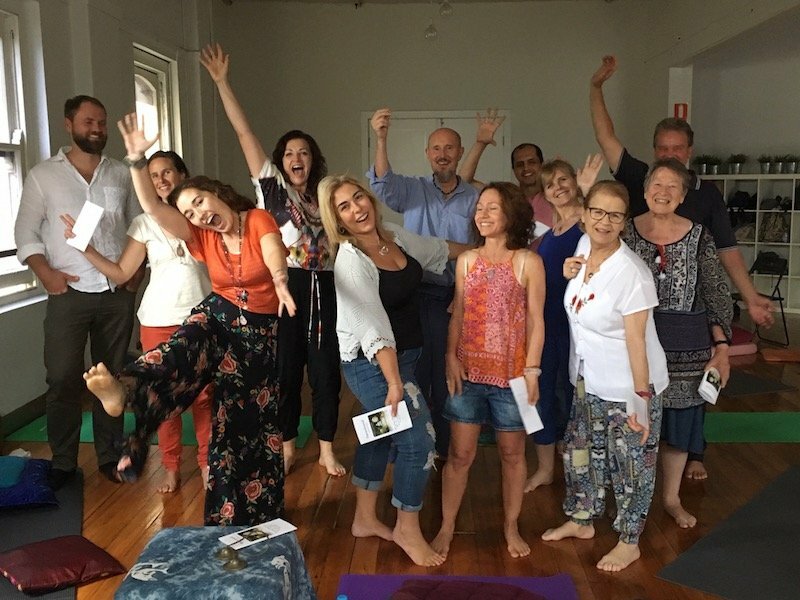 What a fabulous Paradigm Shift gathering it was in Sydney - these events are strongly gathering steam - they never fail to surpass. More and more people are 'popping out of the woodwork' as the Shift accelerates. Everything is consciousness of course, and as we realise the falibility of identity and its fixed place in the flow, the false self is being quickly surrendered in the process. It makes for amazing emergences of soul. It's deeply fulfilling, rewarding and a privilege to be able to host. For a moment in time, we connect deeper than when people have known each other for years. The veils fall, and we see the truth of who we are - connections are soul to soul. What a wonderful weekend we had in Cologne. I want to tell you about my experiences. During the breathing meditation I went to a place which I have known for many years. It feels like I´m in Atlantis just before it was destroyed. I´m in the temple area and a lot of children are there as well. Suddenly I see a burning meteor falling down the sky. Something horrible will happen, I know. We all run into the temple. An earthquake starts and the walls of the temple tumble down. My legs are trapped under the stones and I can´t get out. And I can´t see the children. I struggle to get free but it doesn´t work. And then the water comes. It gets higher and higher and then I´m under water and I know I will die. That was the feeling. I ´m under water and I can´t breathe. Then I heard Open say: You can breathe. You are safe. It´s only an experience your soul made. Whether he said it to me or someone else is not important. When I heard these words I was able to go through this experience. So many thanks to Open. The next day came and we did another breathing meditation. I’m in the broken temple of Atlantis again. I´m under water and I know I will die. But there is no fear. Only sadness. I couldn’t save the children! This was so hard to feel. And I was surprised. I didn’t know that there was so much sadness in me. Now I could feel the sadness, could cry out all my pain and all the tears I didn’t before. And then the pain and the sadness were gone. What a great experience for me. Thank you to all for this atmosphere of acceptance and Support. 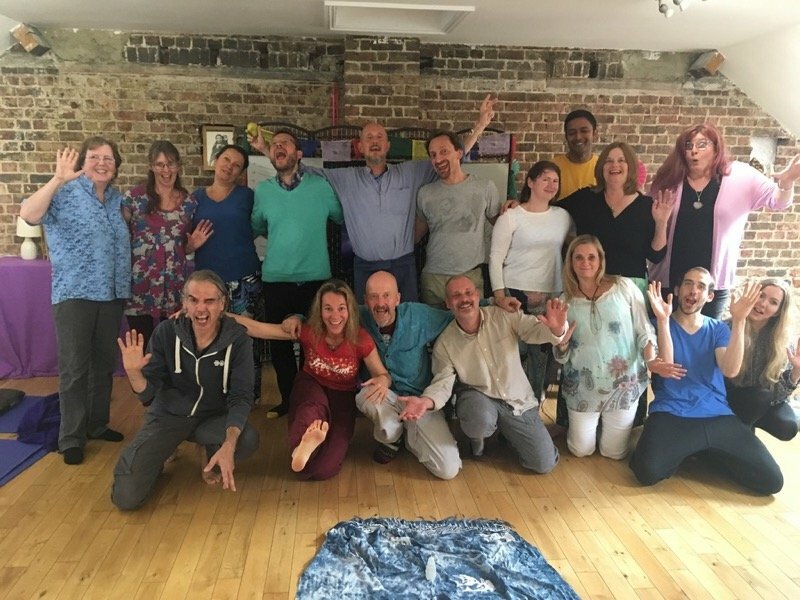 What an amazing experience - how wonderful, how healing! It's when we touch such karma that healing can truly happen. I believe it was synchronistic that you were next to gabriele - whose manifested being stuck in her body, right now. It's highly possible that she was in similar Atlantean circumstances and that's manifesting in this life right now. Thanks for sharing. Thanks for having the courage to go there. thank you so much for your warmly comment. Yes, I can feel that healing begins. Something that you have shared has set off a sadness within me too . I too am able to feel deeply into losing children and the resultant grief. I have not lost my own child but I have been by the side of many many parents in that position. There is a deep grief within me that strengthens my resolve to do as best as I can even if it's often only palliative care . A child in my care has been diagnosed with a rare genetic condition. The last few days we have been talking if the Intervetion and genetic distortion .The genetic report came in on Diwali ( the festival of lights which is also the night of the new moon) . She has unremitting seizures and has been admitted with me for the last two months - I am completely unable to help her and have had to make peace with that fact. I have strong waves of energy running through my crown chakra for about the same time. I am sending her home soon after we put in a tube to help her feed. And recently I helped 'save' a child with liver failure due to a deadly virus called dengue. ( We lost a boy.with similar illness) . She also has her brain affected. I'm not sure how this weaves together or why I am sharing. It just does somehow. I know it but my brain can't seem to grasp what exactly . Lots of love to you ! In the early morning I saw a dream about Temple of Isis ,a great fire and Egypt along with a deep sadness . I feel this is some how related to Dagmars sharing ( though I don't know how ) . Am feeling a little bit more into it . it is really hard to see someone suffering and you can´t help him, espacially children and when they are in your care. You said that you don´t know how it weaves together with my story. Seems to me that a memory of your soul want to come out. And maybe what you saw about the temple and Egypt are the first steps to get closer to a karmic experience. Your sharing touches my heart. It is so hopeful to see you remembering your story. Lots of love also to you. I am currently re-reading Divinicus. Even though I have read the book before ( several times actually) I recognize I hadn't really felt it.Perhaps I read it only intellectually earlier or that I needed to unravel enough to truly''get it". This time with each sentence ,knowing is dropping in .And I am receiving insights galore. I would say it's only now that I am really reading what you have said. That's great to hear Megha. Yes Divinicus is a book that's meant to be felt. Then it can have an enormous beneficial impact. Wishing you well with it. These days it sometimes feels like I am 'getting' bits and pieces of a puzzle. It is surely happening at a rate that is very much dependant on how receptive I am. I know about how responsible I feel about it for example . And how much pressure I put on myself. In this life there have been experiences in which I have actually had to undo the pressure as it didn't allow for more intuitive knowing to come through . As I am reading Divinicus now ,it's almost like a channel of information I wasn't able to access has opened up. That's what it feels like . I apologize for the discombobulated sharings . But they seem to want to be out there .